Escape Rollator,Escape into the next generation of Rollators with the next step in mobility - Escape from Triumph! Escape Rollators are the next step in mobility with various features that gives you the freedom to go anywhere you want to. Available in 3 seat heights, its has the advantage to fit almost any user. It can be easily folded by the lift of a release handle. It can be easily stored away in thh trunk of your car, however the best feature is that it stands when folded which makes it easier to store while not in use. The seat of the rollator is padded for additional comfort. Hand grips are anatomical that reduces pressure and maintains the hand strength and brakes are the easiest to apply than any other walker. The large padded backrest is also depth adjustable, spring loaded levers for easy handle height adjustment and innovative gentle touch braking system which is cable free. 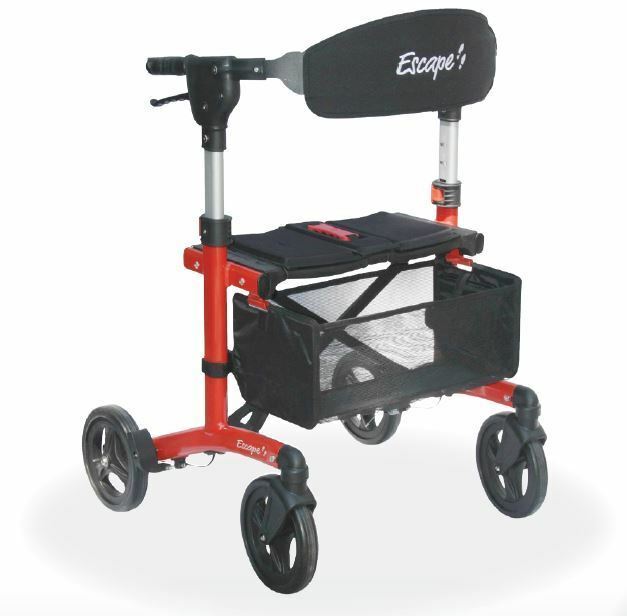 You can also choose from a variety of high quality accessories that help enhance the rollator comfort and performance.